See this special "Laser Fog Light Show" lighting effect in action! [youtube http://www.youtube.com/watch?v=4GlbwI-XNp4] This newly designed 3D "Laser Fog Light Show" gives the you the ultimate in highly sophisticated lighting effects for under $200. This is perfect for your home, a DJ for parties, a nightclub owner or event producer to add excitement to any event. The self contained 15" tall x 6" round tube has it's own fog maker and green laser scanning that projects this 3 Dimensional cone image in a variety of effects on an hour long demonstration mode or a manual mode to create the effects you desire. This unique laser product is so bright that it is clearly visible during the day time in a well lit room. The top will open to allow the mist to drift out and bring the laser light show into the room or leave it closed. We have demonstrated here how adding fog to the room from a standard low cost fog machine will allow you to lay the projector at an angle to send the 3 dimensional cone for at least 20 to 40'. As the cone projects further from the machine it gets larger so that you could make at least 8' around and engulf guests inside the 3D tube of light. 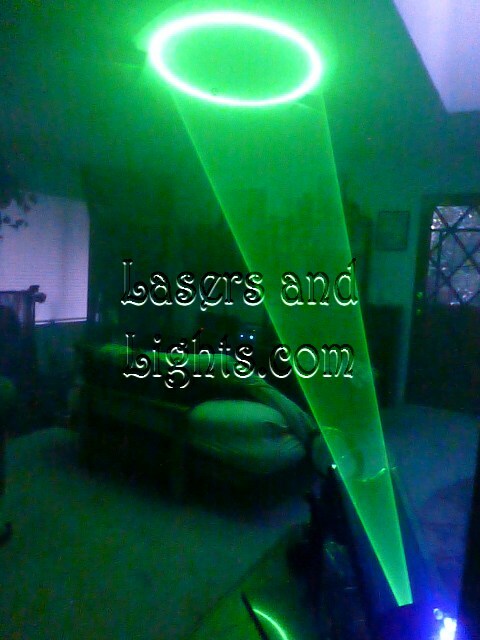 We have this and many other amazing new laser and led lighting effects available to order at our web site www.LasersandLights.com Buy this for yourself or a gift by going to our web site at this address: http://lasersandlights.com/laser-fog-light-show-3d-p-155.html?cPath=10 See how the three dimensional holographic laser cone is shooting across my living room where I have a haze machine in use to create this three dimensional laser tube effect. If this was aimed horizontally the tube could engulf a whole person or group. It really does make you think you can reach out and grab the light. This is another exciting way this low cost Laser Fog Light Show can make a big lighting effect at any event. Newer The NEW Laser Fog Light Show is ready to order for Christmas presents and holiday decorations!! The NEW Laser Fog Light Show is ready to order for Christmas presents and holiday decorations! !